Based on actual events, The Guest is a profound portrait of a divided people haunted by a painful past, and a generation's search for reconciliation. During the Korean War, Hwanghae Province in North Korea was the setting of a gruesome fifty-two day massacre. In an act of collective amnesia the atrocities were attributed to American military, but in truth they resulted from malicious battling between Christian and Communist Koreans. Forty years later, Ryu Yosop, a minister living in America returns to his home village, where his older brother once played a notorious role in the bloodshed. Besieged by vivid memories and visited by the troubled spirits of the deceased, Yosop must face the survivors of the tragedy and lay his brother's soul to rest. 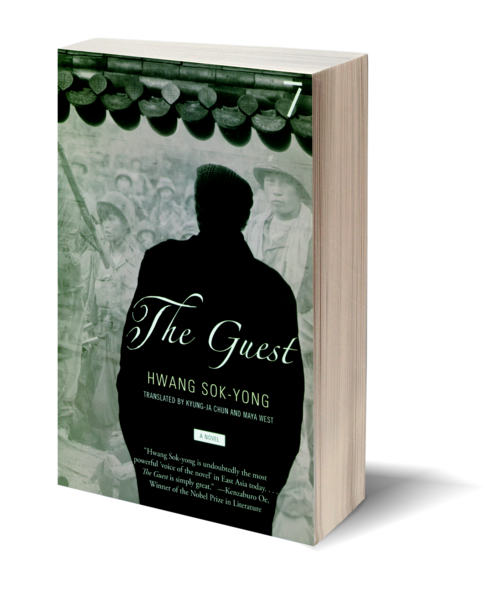 Faulkner-like in its intense interweaving narratives, The Guest is a daring and ambitious novel from a major figure in world literature. Hwang Sok-yong is one of the contemporary masters of Korean literature. His work, which grapples with the troubled history of his divided country, has resulted in his imprisonment, his exile, and the rare achievement of a wide international readership. Hwang’s novels in English include The Old Garden, a tragic love story set against the backdrop of the end of the Cold War and South Korea's political revolution of the eighties; The Guest, based on the true account of a violent clash between Communist and Christian neighbors in a Korean village town; and The Shadow of Arms, inspired by his experience as a Korean soldier in the Vietnam War. Some of his recent bestsellers in Korea, where Hwang is among that country’s most popular writers, include Baridegi (Princess Bari) and Gaebapbaragibyeol (The Evening Star), a coming of age novel that Hwang wrote as a blog.